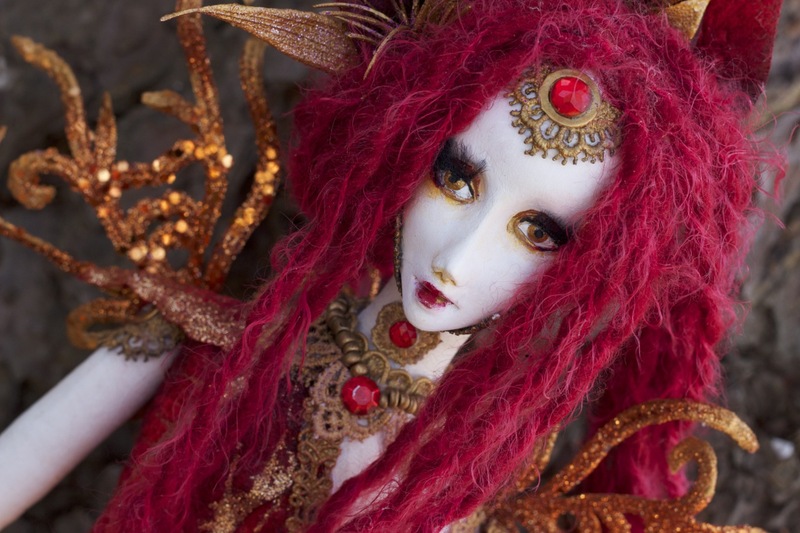 I was hoping to finish my purple doll today, as well as begin some new work, however I have been miserablly stuck in bed, bundled up along with my 4 cats.. Locked in my bedroom with 2 heaters, it will not get any warmer than 60 degrees in this old crap above ground wooden house that I live in. When I walk in my kitchen and living room (which is also my work area) I can literally see my breathe so I dare not go in their if I can help it. Everything I touch in their feels like ice. I am so extremely bored since I am a very energetic person and it is becoming torture to sit here and not be able to work on anything. So I decided why not pass the time and write a quick blog entry for the day. 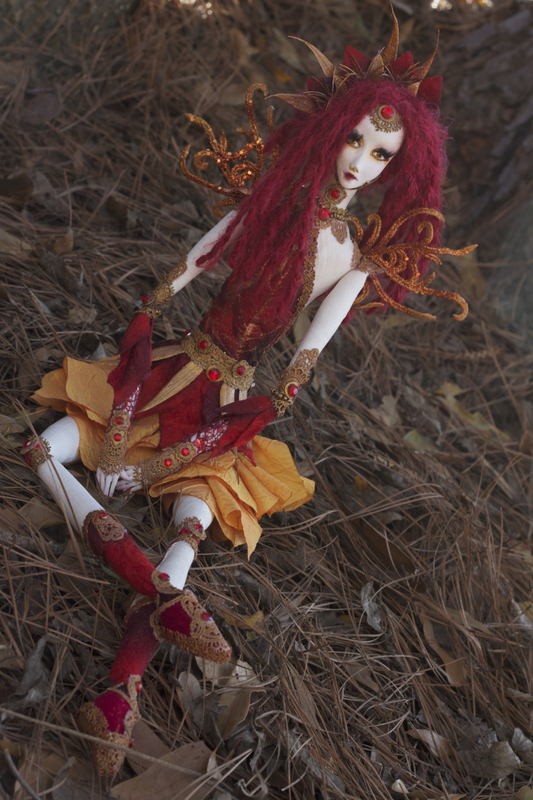 I don’t have any new works to share so I decided to share a few of my older dolls that are still waiting for homes. 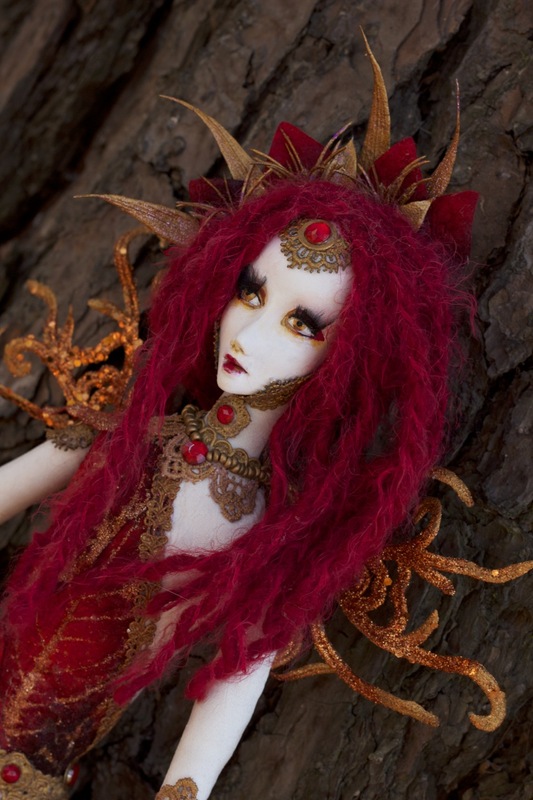 Here are a few of my dolls that are for sale. 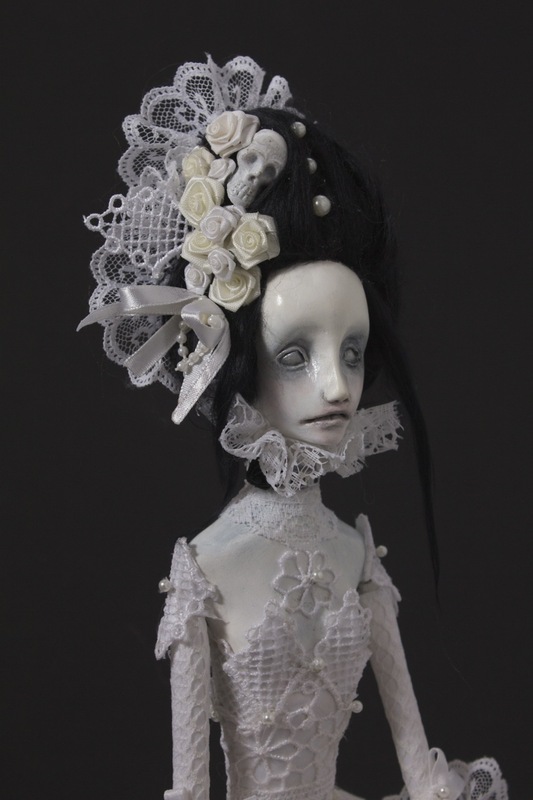 She is one of my gothic halloween dolls that is fully sculpted in air dry clay. I absolutely love lace and pearls so I had a lot of fun designing her costume as well as individually stitching all the little pearl beads. 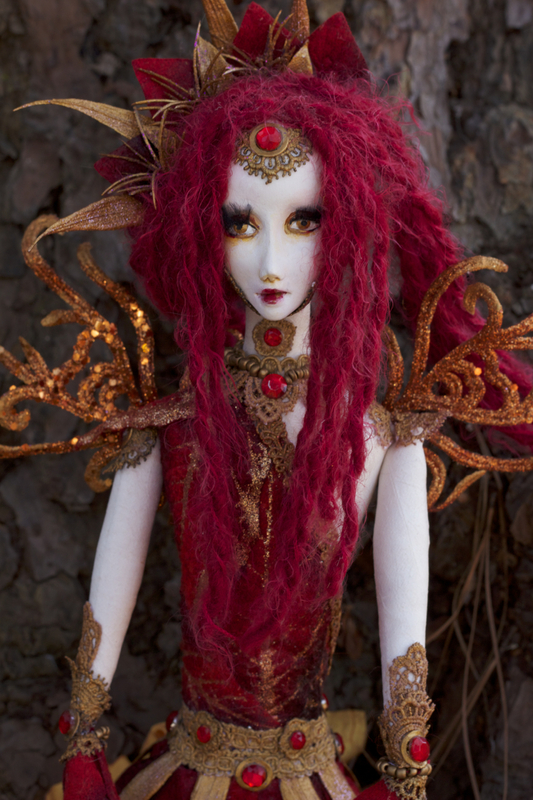 She is one of my favorite dolls that I have created and parting with this one is going to be tough! 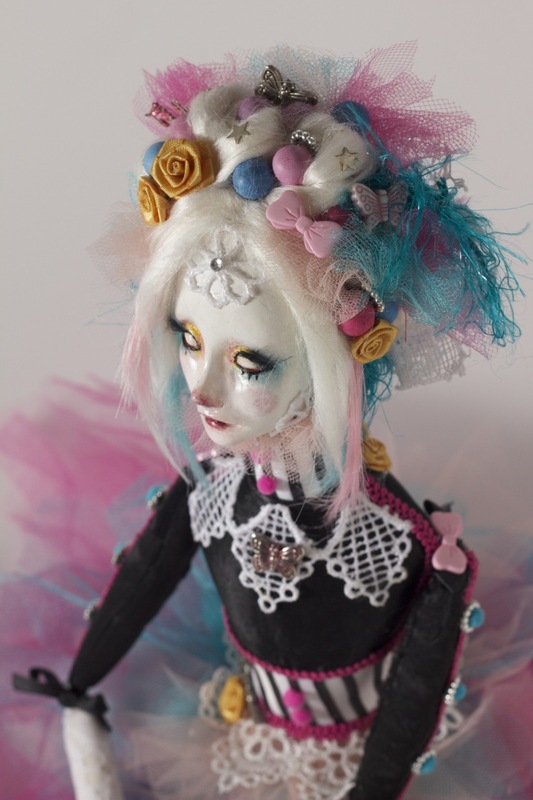 I created this doll for the Art Doll quarterly circus challenge and am so excited to have received my copy yesterday. She is shown in the spring 2014 edition. 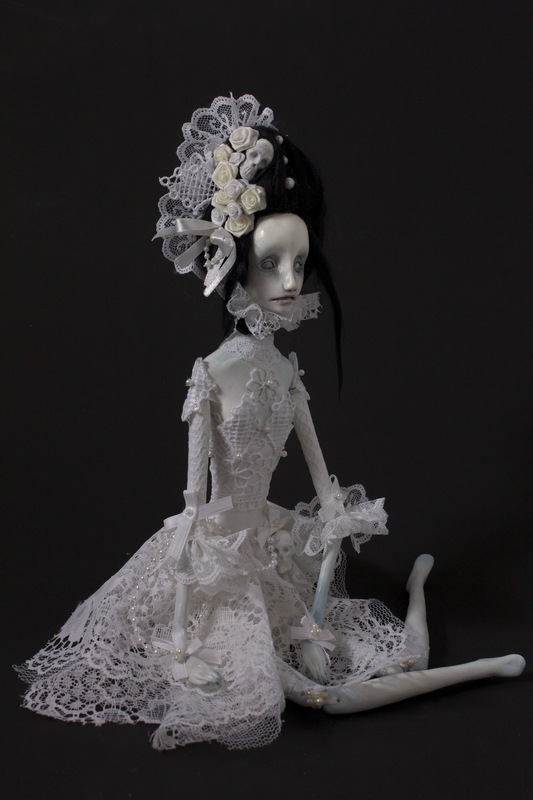 Seraphine is my newest doll. I decided to go a bit more fantasy on this one after being inspired by all the beautiful fairy costumes I saw at the Texas Renaissance festival. I also decided to give this one eyes(I often leave them solid white or black) however after a few people critiqued me on this I decided to give her the eyeballs. I am glad I did because I think it works well for her and gives her a bit more life. I also experimented using yarn for hair rather than my regular use of viscose. I am always looking for new things to use and lately I have had a bit of a yarn obsession so I had a lot of fun collecting some new pretty colors. 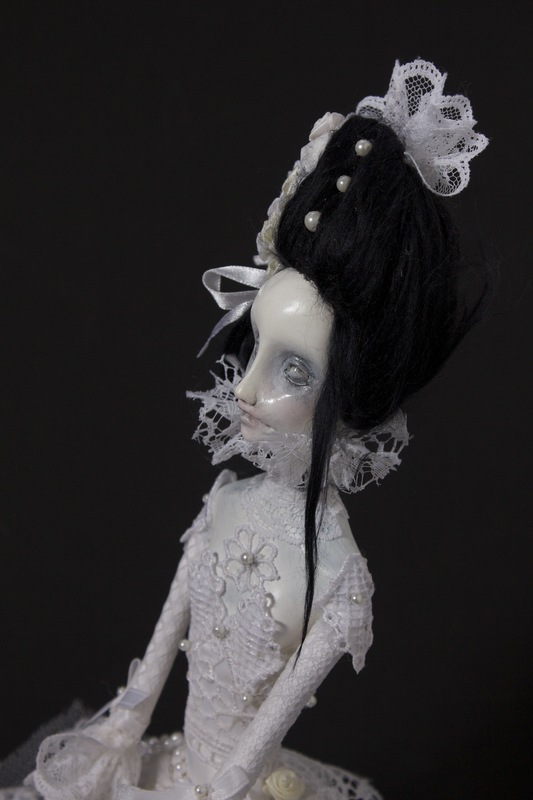 I have a few planned for some future dolls as well so I am excited about making those very soon. I love both gothic style and fantasy. Even though I am often drawn to darker works I also tend to go through periods where I want things to be magical and colorful (as seen clearly in my newer works). This also tends to be determined by my mood (which changes often) or my interest at the time. 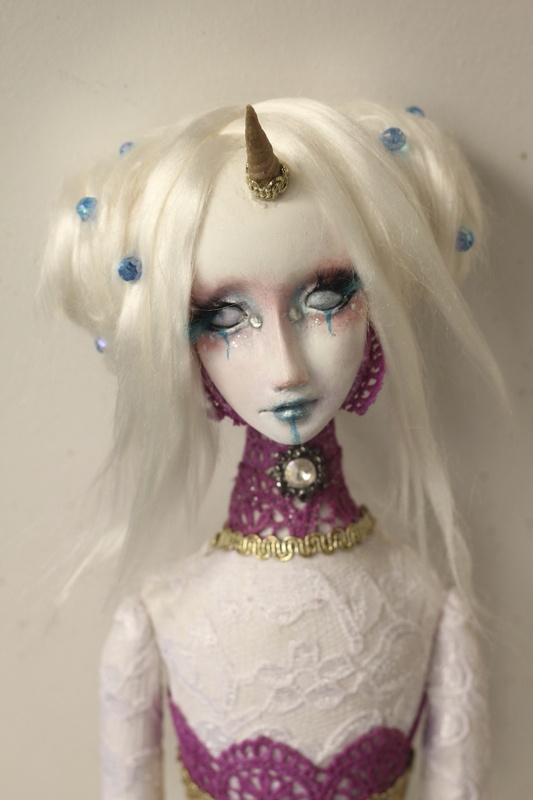 For this one I was working on a unicorn inspired costume (for the Texas Renaissance Festival) at the same time I started this doll ( I LOVE unicorns by the way) . 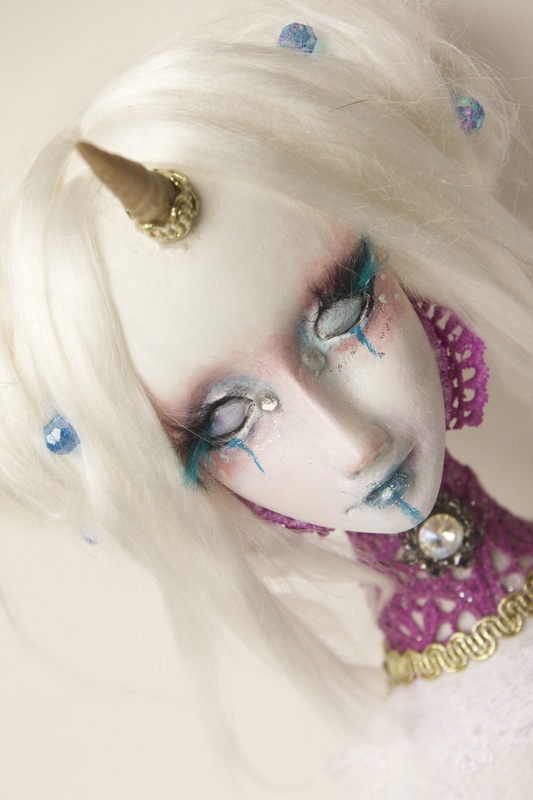 Since I was in unicorn mode at the time I decided that is what this doll would become. 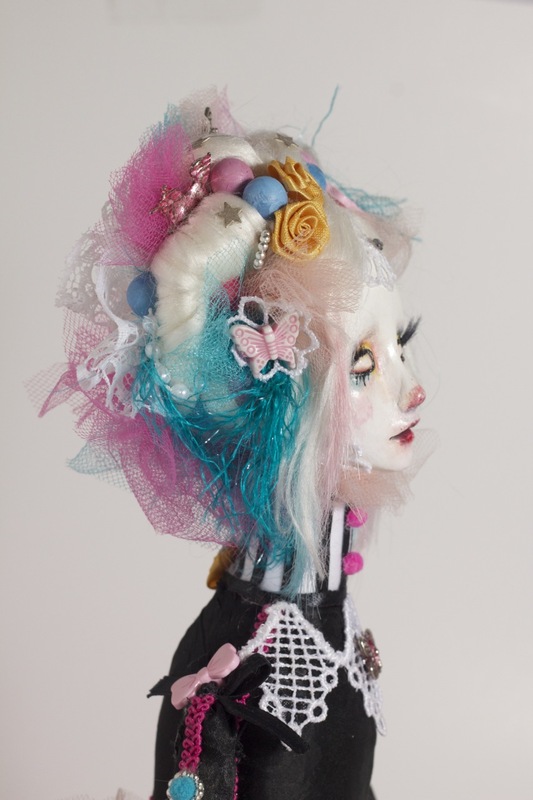 Well not literally a unicorn…but inspired by……. I really love this sculpt. I was looking at a lot of gothic architecture at the time and thought it would be cool to design a doll using some designs from some of the churches. (an idea I would like to play with a bit more). I also love vampires so that is what she was inspired to be. 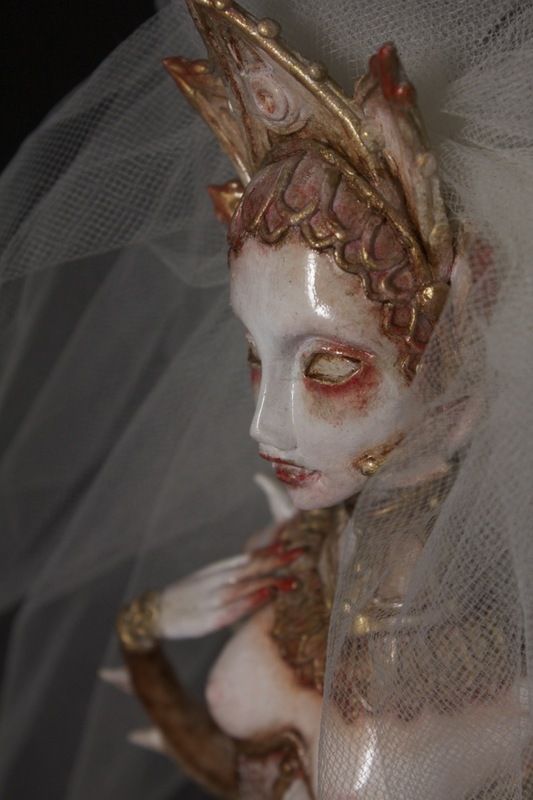 For this sculpt I used polymer clay rather than the Air dry as I find I am able to get more intricate details. 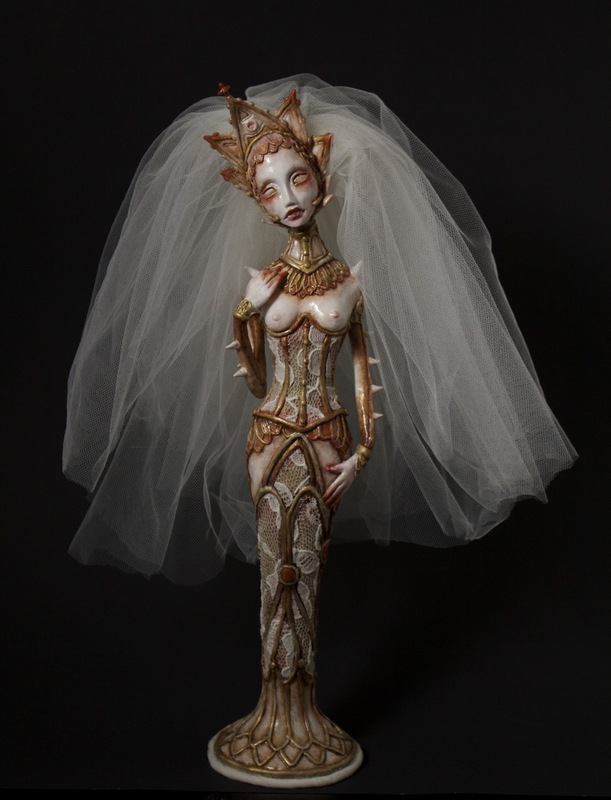 Looking back through my polymer dolls I am really inspired to create some more of them. I walked away from polymer a while back after my hands and wrist started giving me problems so I am only able to do a limited amount of these sculpts. I am always looking for an excuse to make a costume so when I heard about the zombie walk I decided last minute that I wanted to throw together a quick costume…..not that a zombie really requires a costume (other than blood and guts) however this is the idea I saw in my mind. I don’t know what I was possibly thinking, doing another corset in 2 days (while I am still in the process of finishing ren fest costume) but when I have an idea in my head, I have to do it or it will drive me crazy. So I didn’t take it all that seriously since it was most likely going to get stained with blood. I didn’t even go shopping for fabrics. I just used any leftover fabrics I had laying around and improvised. In the end though I didn’t even get full of blood. Honestly, I love zombie movies. I am a fan of The Walking Dead, Night of the Living dead, etc however I never really had the strong desire to dress up as one. (I would have much rather been a vampire). I didn’t really want gross wounds on my body nor did I want blood all over me (because I knew it was going to drive me crazy) so I was a pretty tame zombie. I just wanted to look dead plus I have not the slightest clue how to do latex. It could have been a disaster if I tried haha. My boyfriend on the other end, wanted to be a little more bloody so he used elmer’s glue and tissue paper and created some wounds. I have never seen him get so excited about dressing up (which is funny because he rarely dresses up). Unfortunately, I did not get any pics during the walk but we took a few shots before.